Good afternoon friends. My husband has been asking me to make this for so long I feel terrible. I don't even remember how long it has been but I can tell you it has been months, if not a year or better. I love this dessert, and I love my husband so I am not sure what took so long. I can remember the first time I had this. 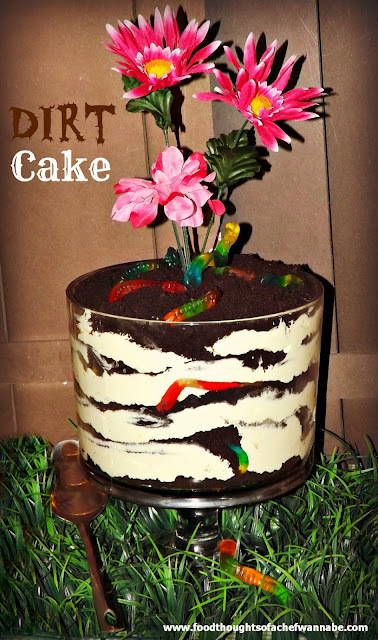 I was a kid, and I was THRILLED with the whole concept of eating worms from dirt. OMG, what does that say about my developmental health? Well, anyway, I have made it several times throughout my adult life, a few times in a sand bucket from the toy section, using the shovel as the spoon to serve. I have done it in a flower pot and used a clean new trowel to serve it. You can really do a million things with this, so I encourage you to be creative, it is so fun. AND delicious! By the way, I used more Oreo's than I ever have on this recipe I won't be going back to using less anytime soon. First of all find a container. Traditionally you can do this in a CLEAN sand bucket with a shovel (toy section) or a clean flower pot. I did mine in my Pampered Chef Trifle bowl, you can even do it in a plain bowl, just pick your vessel my friends, pick your vessel! I am sure you have had this before, or you WISH you had it before, but now, you CAN have it. ANYTIME you want it! This made my hubby happier than a worm in dirt! Thanks for posting this.. i forgot about it.. I made it in a plastic flower pot for a wrap up summer party and put it on the table as a centre piece.. Such fun as no one knew it was a dessert! I love this recipe and have forgotten about it. I need something for a quick birthday party and I think I found the answer. Love your posts.